I program the closet for an outfit to my taste. The windows zoom in and out on parts of the city at my command. You need only whisper a type of food from a gigantic menu into a mouthpiece and it appears, hot and steamy, before you in less than a minute. I walk around the room eating goose liver and puffy bread until there’s a knock on the door. Effie’s calling me to dinner. While reading The Hunger Games for the first time, I remember being dazzled by Katniss’ room in the Training Center, with the fancy shower buttons, the electric current hair brusher, and the insta-food machine that Katniss orders goose liver and puffy bread from. I’ve never eaten liver in my life and so when I took to Twitter and began my research into “goose liver”, I quickly found out that it was very likely foie gras. I’d only heard of foie gras from the food guy Ted on Queer Eye for the Straight Guy. I’d never eaten it and I most certainly had never cooked it. I watched a lot of videos on how to cook foie gras and also decided that I never want to try liver pate. Ever. 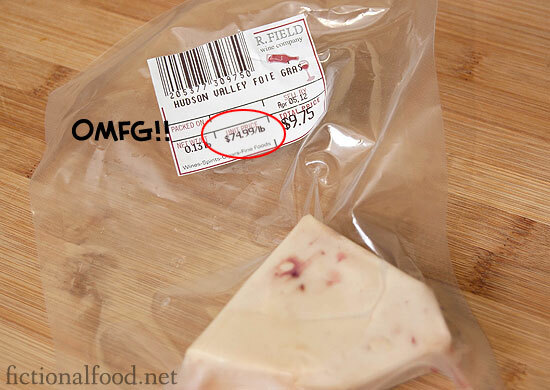 Now, being a foie noob, I had no idea about the ethical dilemma this expensive delicacy presented until my friend back from high school replied to my Facebook status to say that Whole Foods doesn’t carry it because it’s on their “unacceptable list”. I really had no idea why because I thought a liver was just a part of an animal, so what’s the big deal? Eventually I wound up at Serious Eats, reading a fascinating article about foie gras farms in the US, the method of gavage, and finding out how ducks seem to like women more than men. The idea was pretty gross, with humans essentially turning ducks into obese ducks. The whole thing reminded me of the Axiom from Wall-E. You know, the space ship that was feeding a bunch of already fat people shakes to make them even more fat? Only they didn’t get killed and eaten in the end. But since I eat meat, and felt reasonably assured that foie farms in the US (there are only 3) are not quite the disgusting farms you see in animal rights videos, I decided to give this a try. Besides, I heard this stuff was expensive, so it’s not like I’d be buying a lot. Boy was I in for a shocker. Yeah, this stuff costs 75 bucks a pound. I nearly choked while on the phone with the lady at the gourmet food shop. But then she told me they sell them in 10 dollar pieces. I felt much better. I wasn’t about to spend 75 bucks on something I might not even like! Still, I couldn’t believe how small the piece was. No biggie though, I could cut thin! Something to note: I apologize for calling this goose liver and puffy bread when I’m using duck foie gras, but apparently the three farms in the US only raise duck foie gras. If I wanted goose foie gras I’d have to either find someplace that imports it from France or Spain, buy pate or liverwurst instead of fresh, or raise my own goose. And I wasn’t about to force feed a goose myself. Duck would have to suffice. I saw a video about cooking foie gras on medium heat from frozen, which sucked because I’d already accidentally defrosted my foie gras by forgetting to put it away as soon as I got home. I ended up just cooking it on medium high, burning one side in the process because the pan was too hot. It wasn’t fully cooked in the middle, but this was what I wanted because it was going to bake in the middle of bread anyway. 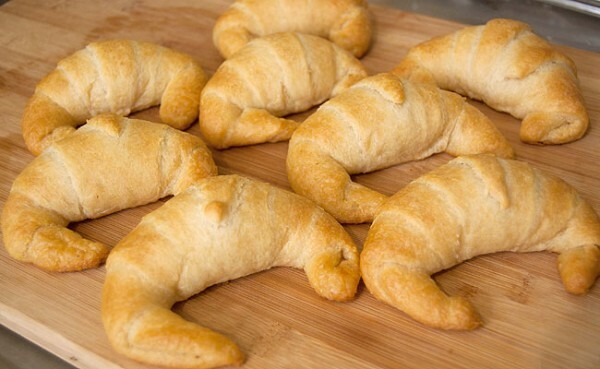 Now, when I hear “puffy bread”, I think croissant or crescent roll or dinner roll, but a croissant is elegant, decadent, and puffy, so this is what I went for. I was going to be my usual gung ho self and make them from scratch, but when I saw how long it takes and how much work it is, I decided to save that adventure for another day. After all, what if this whole thing sucked big flaming arena fireballs? I bought Pillsbury Crescent dough. The buttery and flaky one. I wanted it to be full-on Capitol style and while the districts no doubt don’t get butter, I’m sure the citizens living in the Capitol have no qualms about eating Paula Deen style. This was the biggest piece I rolled up and since the foie gras shrunk during baking, I think it’s probably better to buy 2 slices of foie gras per 8 croissant can of dough so that you can put this much in each roll. Anyway, stretch it out far and roll em up, curling them to the middle. You can’t even tell there’s foie gras in there! I baked these for 15 minutes. Here they are fresh out of the oven. 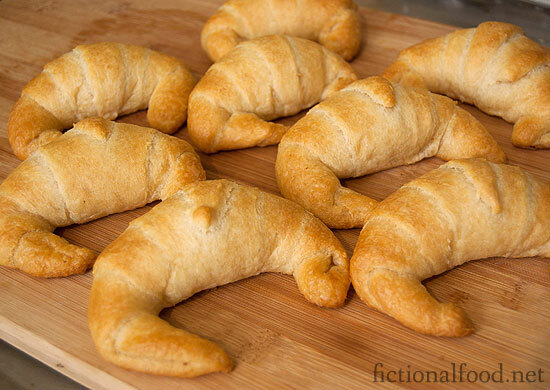 They look perfectly normal, though not as pretty as say, Costco croissants. I took a bit and WOW! The piece looked so tiny, but the inside was insanely buttery, rich, and moist. The dough was already buttery, but with the fat from the foie gras, suddenly the middle of the croissant was transformed into this melt-in-your-mouth sensation with a light hint of foie gras. I had inhaled two before I knew it. 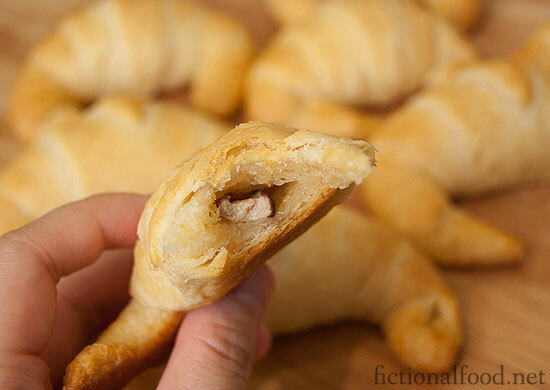 I invited my hubby to try one and he insisted he’d only have a bite because he doesn’t like croissants, but he ate the whole thing and said it was pretty good. One thing’s for sure, it’s totally decadent and totally Capitol. It’s a sure winner at a Hunger Games party and I can totally see Katniss snarfing down three or four of these and then just being ready to go pig out at the buffet. I do wonder though, if she knew what she was ordering. She must have caught wild goose before and eaten its liver, but is a regular goose liver different from foie gras other than size? Tell me if you know! Since this has meat in it, you should refrigerate it and then when you’re ready to eat them again, just toast them until warm and crispy. Heat small skillet on medium high heat. 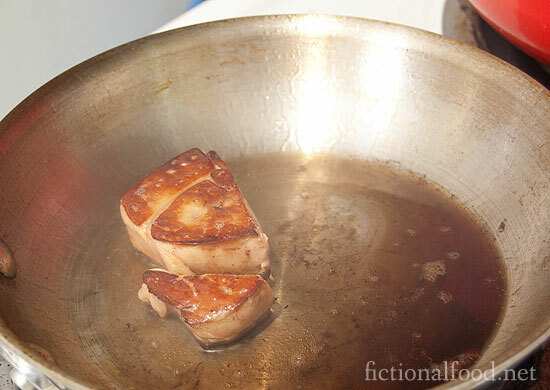 Pan sear the foie gras as-is, sprinkling a little salt on. 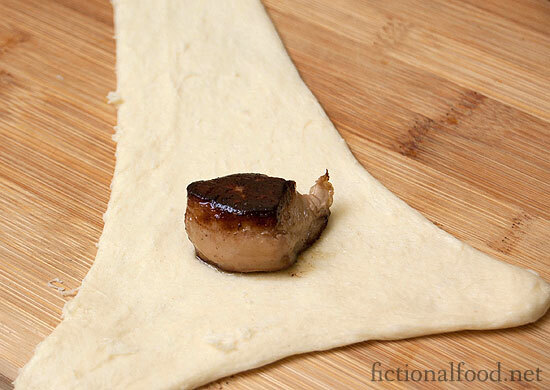 Cut foie gras into 8 pieces and roll into the crescent dough triangles. 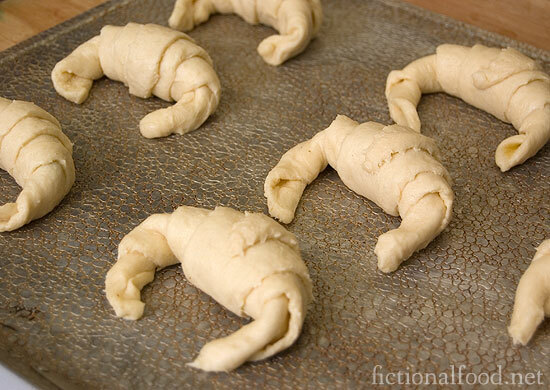 Form into crescents. Bake for 15 minutes or until a nice golden brown.